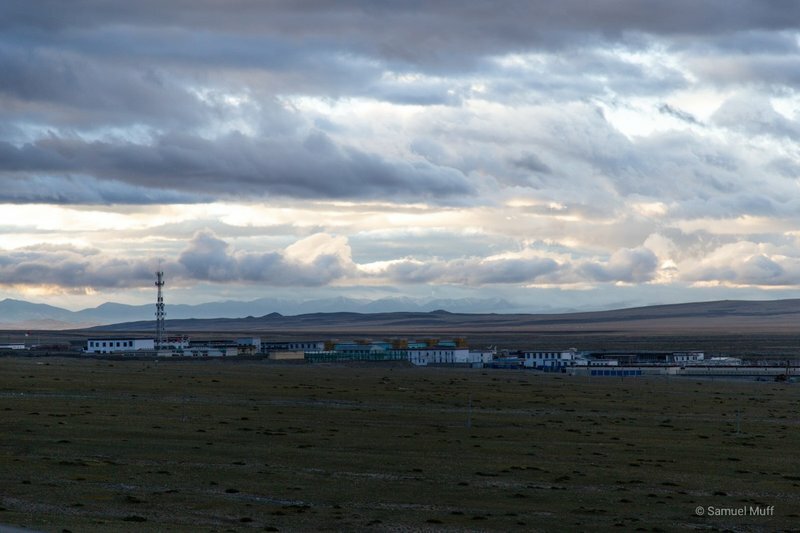 After spending one more night at Lake Manasarovar, we moved to Darchen, the base for the Mount Kailash kora (pilgrimage), the next day. There was another monastery visit on our itinerary which we skipped in order to give more rest to our tired legs. 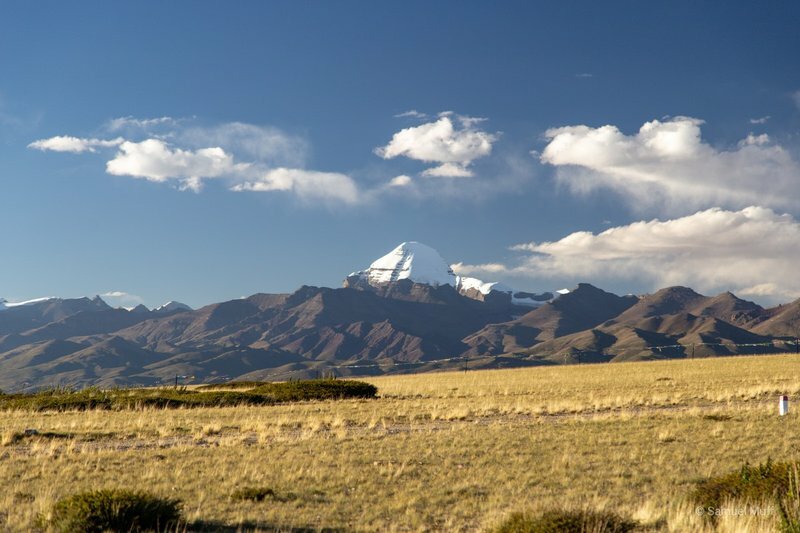 After one night in Darchen, we departed on our kora around Mount Kailash at the break of dawn. The first day involved around 20km of hiking, climbing from 4’700m to a bit over 5’000m. 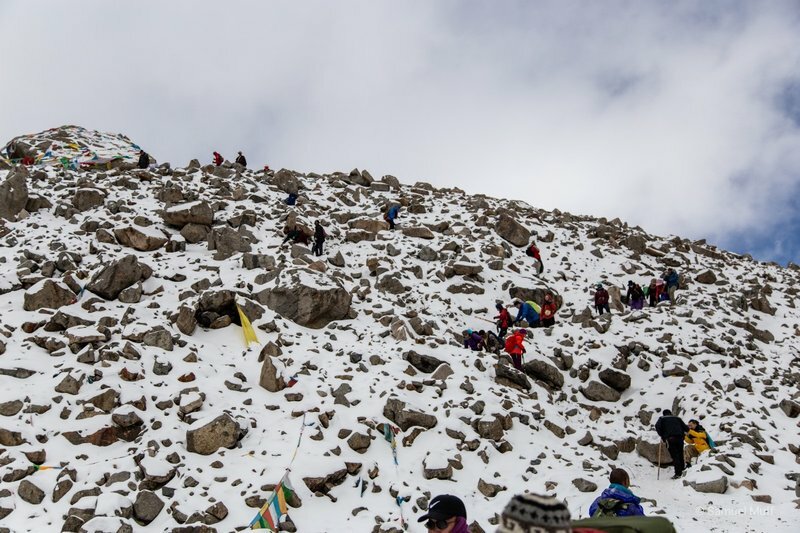 There were much more pilgrims here than at Lake Manasarovar and the trek was very busy. 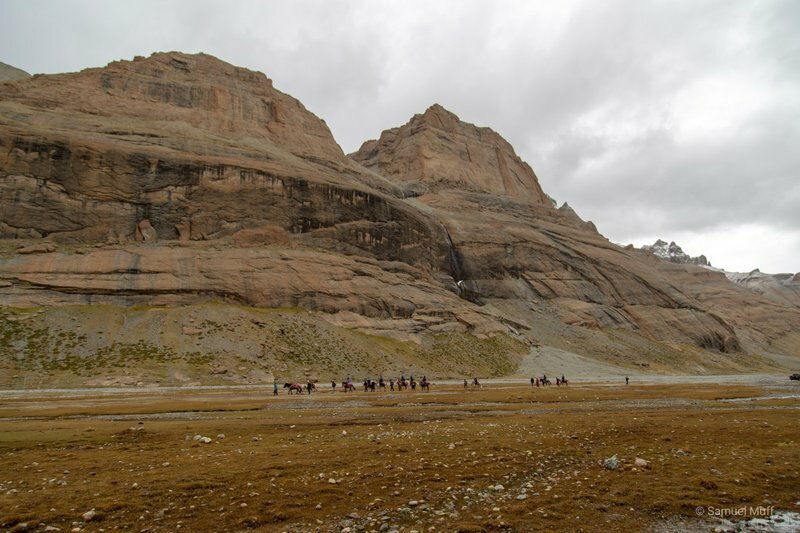 We saw many Indians being carried up the trek on horses. 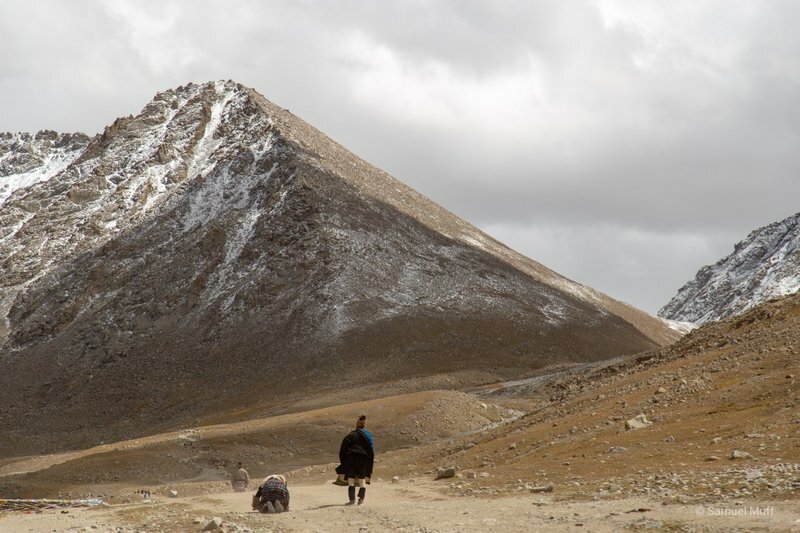 Apparently, the Indians who go to Kailash are very rich and therefore not at all accustomed to physical exercise. On the other hand, we also met one man who is walking the entire 52 kilometers of the kora in one day, everyday since two years. The atmosphere in general is very special, as most people there are extremely devoted to their religion. We saw many pilgrims that do this kora using prostrations instead of simply walking. Prostration is the practice of praying, while first going down on your knees and then laying down completely flat on the ground. After getting up again, the pilgrims do a few steps and repeat the procedure. It takes these people months to move all the way around the mountain. 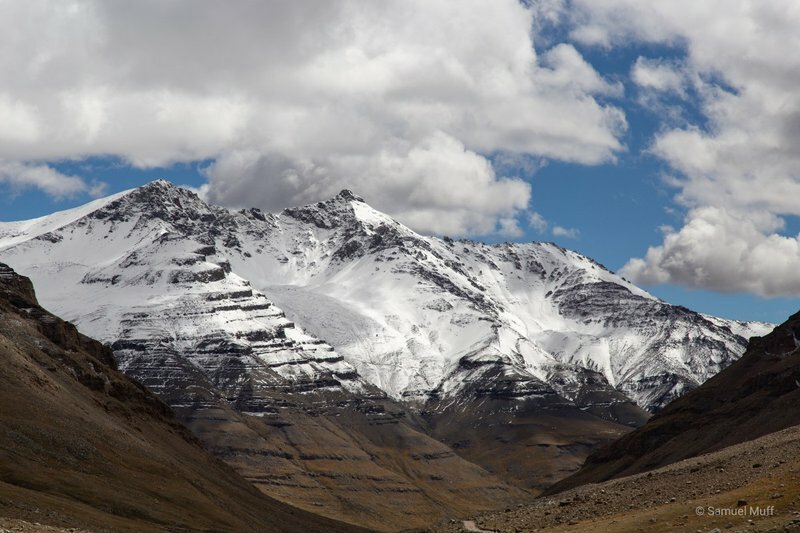 While most of the day was very cloudy, towards the evening the sky opened up a bit and we were able to see the bottom of Mount Kailash. The top remained in the clouds though. 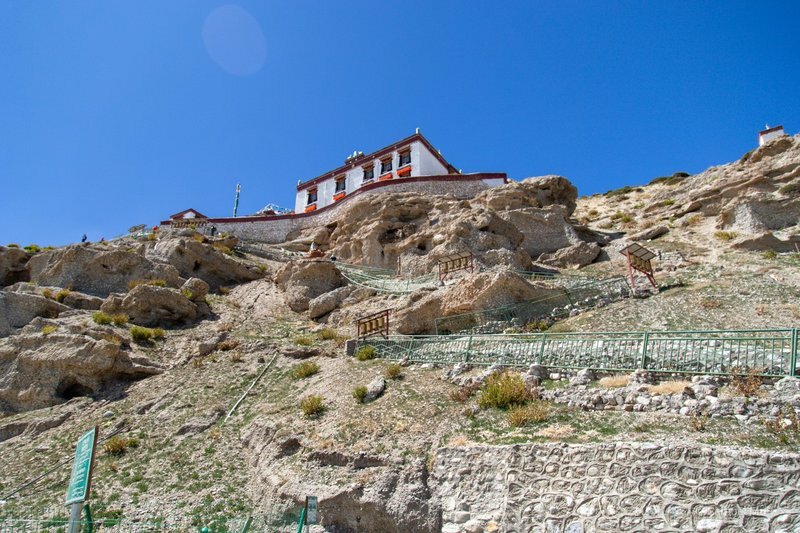 We spent the night at a monastery at an altitude of over 5’000 meters. We were quite surprised when we looked outside the window after waking up. 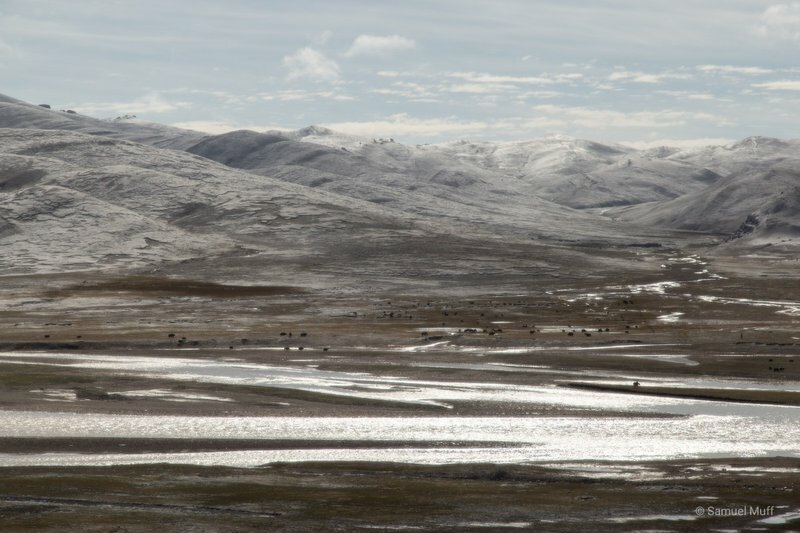 Snow has fallen overnight and the dry, grey-brown landscape has been turned completely white. We started our climb up to Dromla pass very early in the morning. 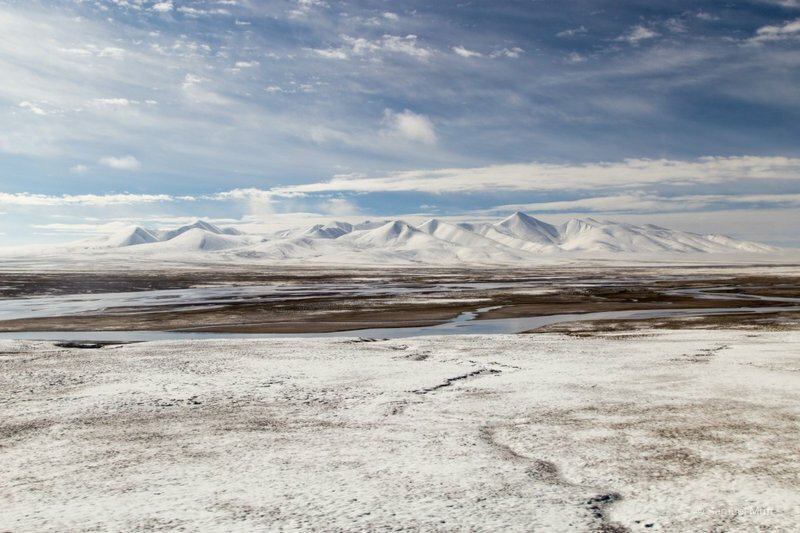 The trek was already full of people, but besides the sound of boots in the snow, there was silence. No one talked. Climbing up at this altitude was very strenuous. Oxygen was not wasted on conversations. The higher we climbed, the harder each step became. After a bit more than 3 hours, we finally reached Dromla pass, at 5’645 meters above sea level, the highest point both of us have ever been. Moods got lighter up there, as everyone found joy in their achievement. The hardest part, however, was still to come. The way down was much steeper than the way up and the fresh snow had turned into hard ice at this point. Our hiking boots were no longer appropriate for the conditions. We were still better off than some pilgrims who walked in sneakers with non-existent profiles. After around 2.5 hours, partly spent sliding down on our butts, we managed to reach the valley without injury. There, the path became much easier, going down very gradually. However, there was still 12km left to go. We reached our destination very exhausted, after 10 hours of walking. 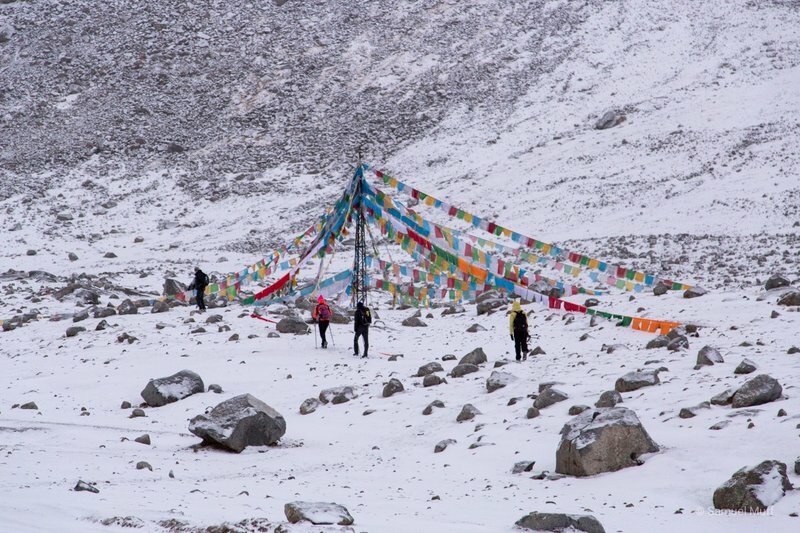 On the last day of the kora, we started very early, about one hour before sunrise, with our headlamps on. There was only around 10km to go and it was all downhill. 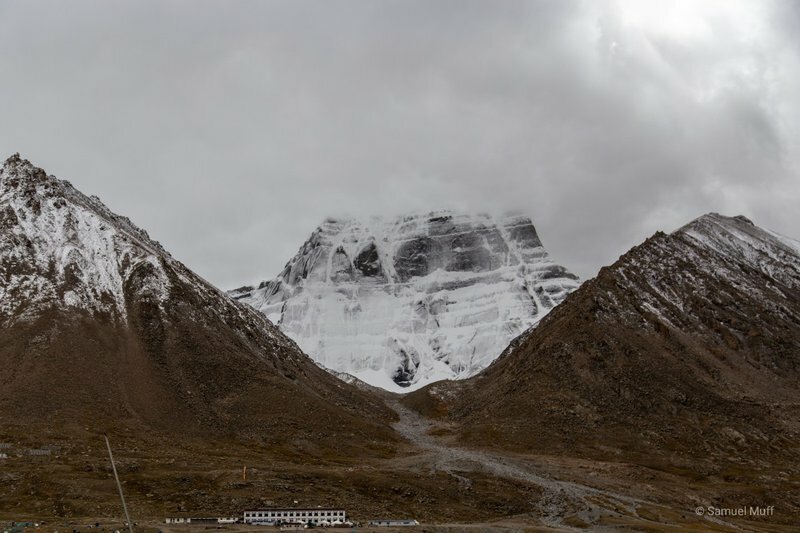 We got some beautiful views of the sunrise over Gurla Mandhata, the mountain we have seen already during our Manasarovar kora. 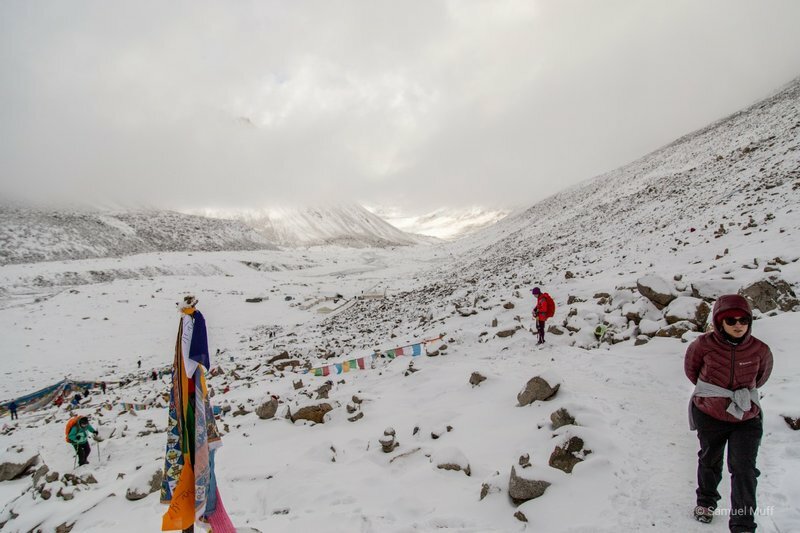 After less than 3 hours, we reached Darchen, where we were rewarded with a nice breakfast. 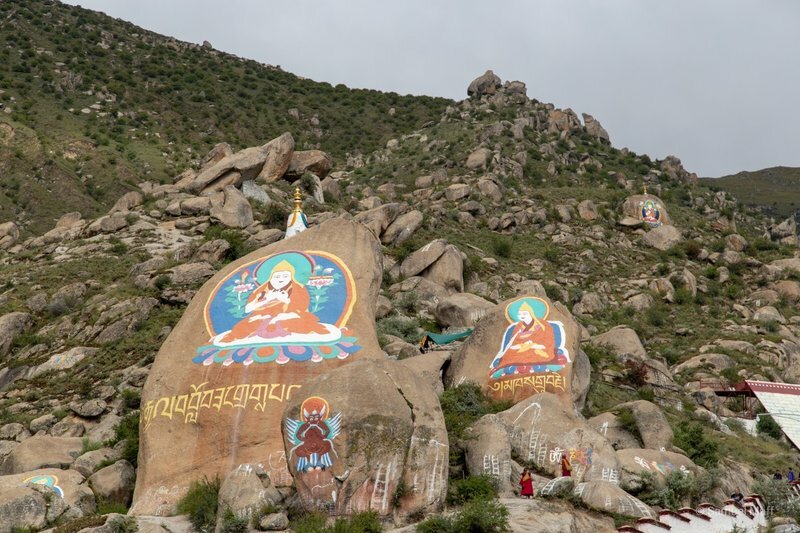 We liked the trek around Mount Kailash much more than the one around Lake Manasarovar. 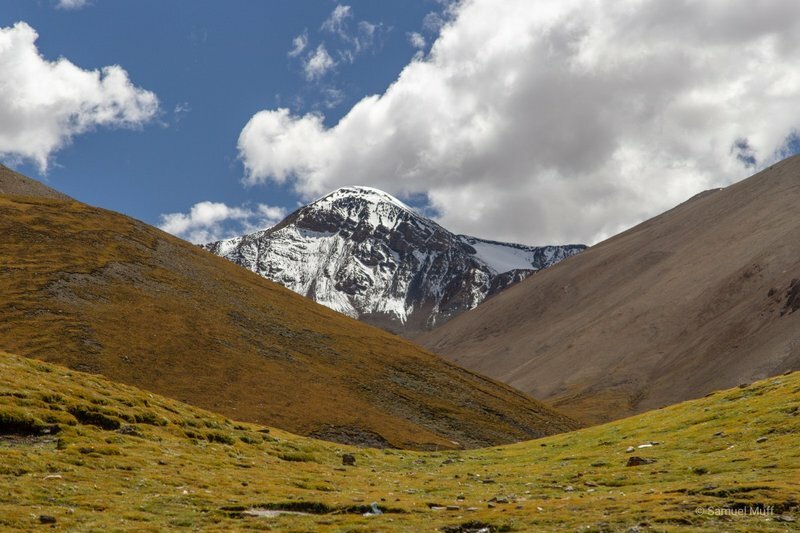 Despite the fact that it was almost always cloudy and we have not entirely seen the mountain we circled for the whole trek, the mountain views were interesting and varied. 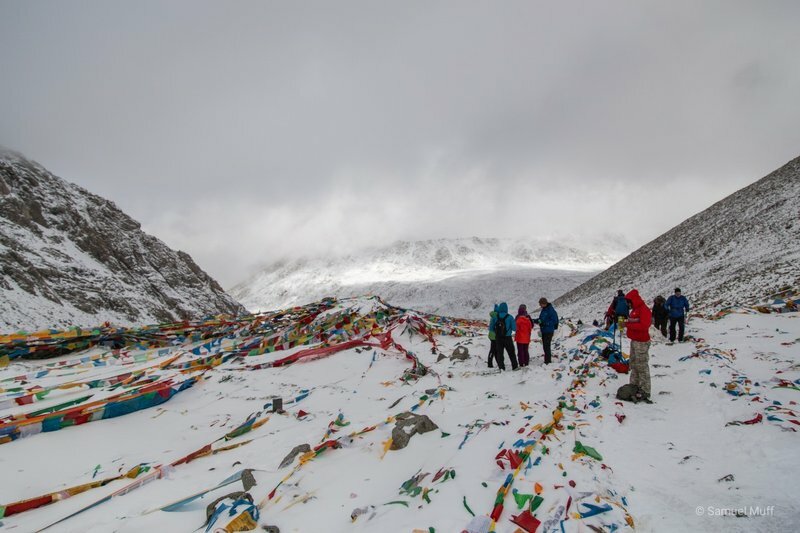 Also, seeing the pilgrims and experiencing the atmosphere around this mountain made it worth enduring the tough conditions. 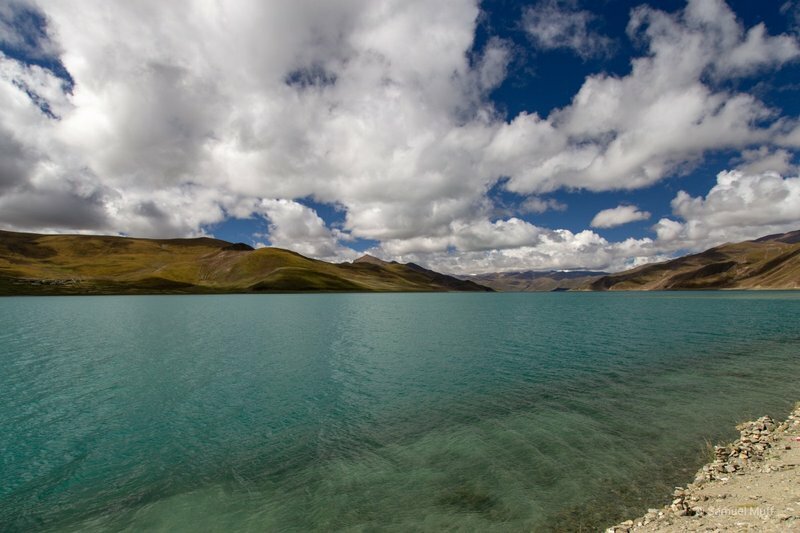 We arrived at Lake Manasarovar in the evening of the 18th of September. 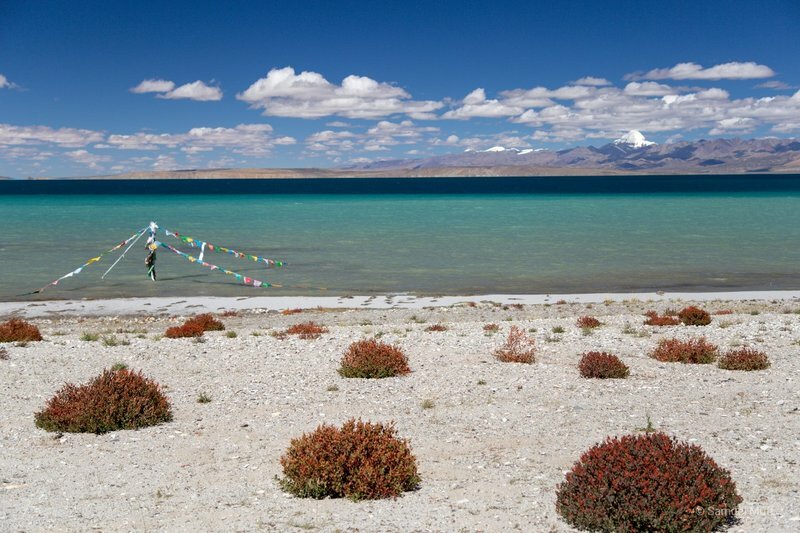 Lake Manasarovar, at an elevation of 4’590 meters, is one of the highest freshwater lakes in the world. 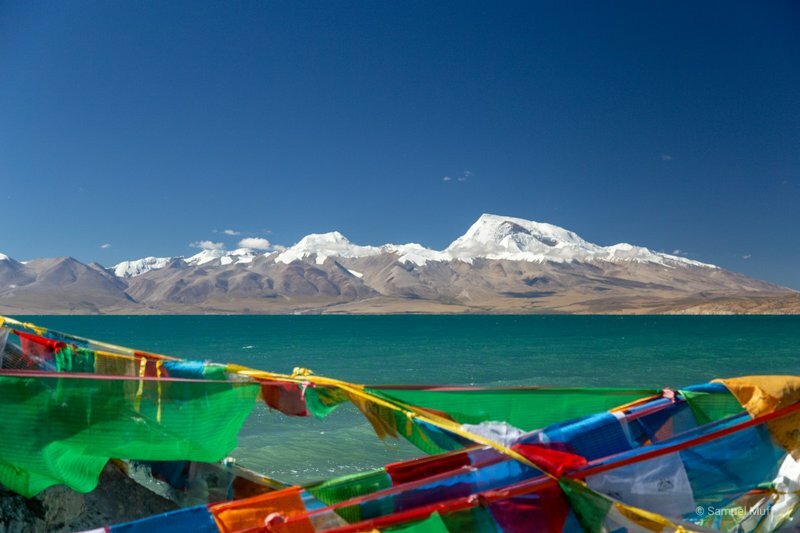 It is a holy place in 4 major religions (Hinduism, Buddhism, Jainism and Bön) and is closely related to the nearby Mount Kailash, with Lake Manasarovar representing female and Mount Kailash representing male. We started our 4 day trek around the lake the next morning. 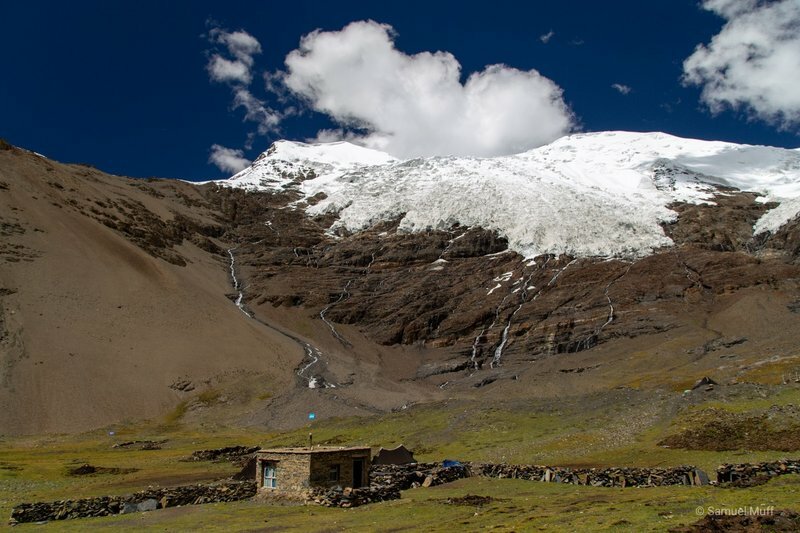 The first day was actually the best of the trek, as it provided great views of the mountain Gurla Mandhata in the south of the lake. At an elevation of 7’694 meters, this was the highest mountain both of us have seen so far. 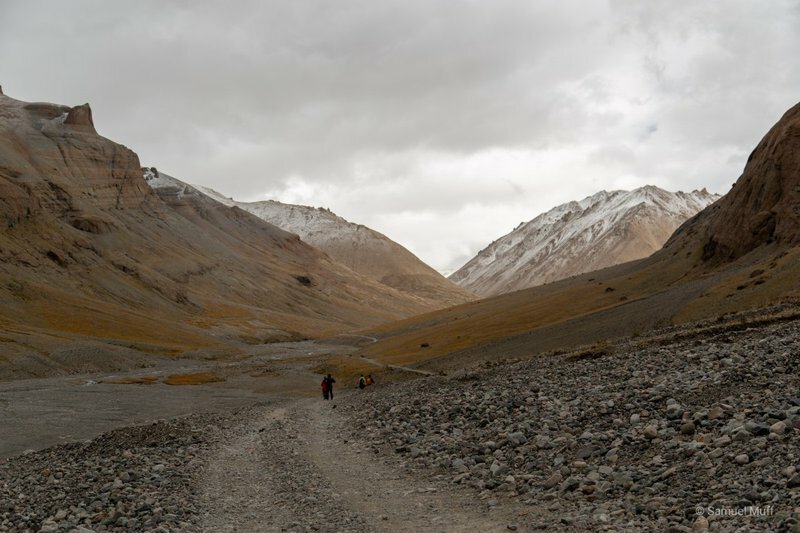 The trek followed the shore of the lake for the first half, but then moved away from it as we approached the town Hor, where we would spend the first night. Despite being almost entirely flat, the first day’s route exhausted us quite a bit, as we walked 29km at this altitude, after hardly moving for 3 days. The second day started with a bit of a shock, as our guide announced that today’s route would be 30km instead of the 22km listed in the tour itinerary. There was an option of taking the car for half of the way, which Marta took, while Sam just about managed to walk the entire way. 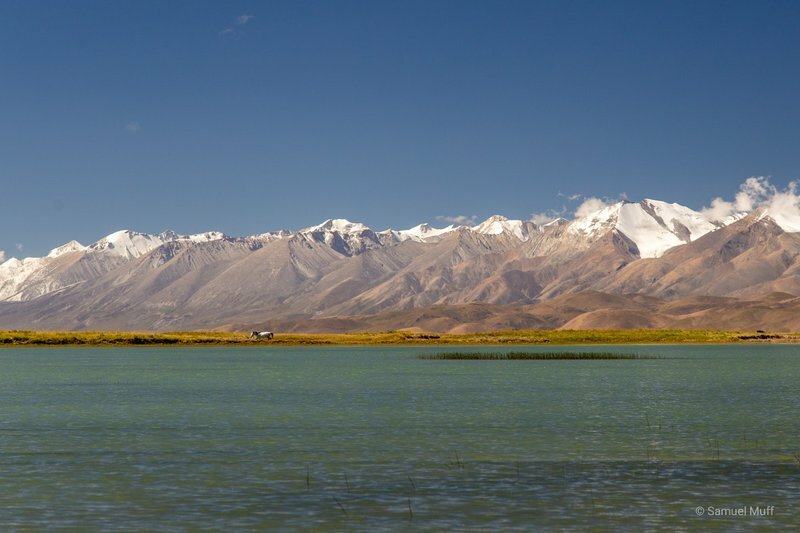 On this day, we could already see our next destination, Mount Kailash, in the distance. Fortunately, the last two days were easier, day 3 was 22km and the last day only about 10km of walking. After the third day we stayed at a monastery on a cliff which offered nice views across the lake. 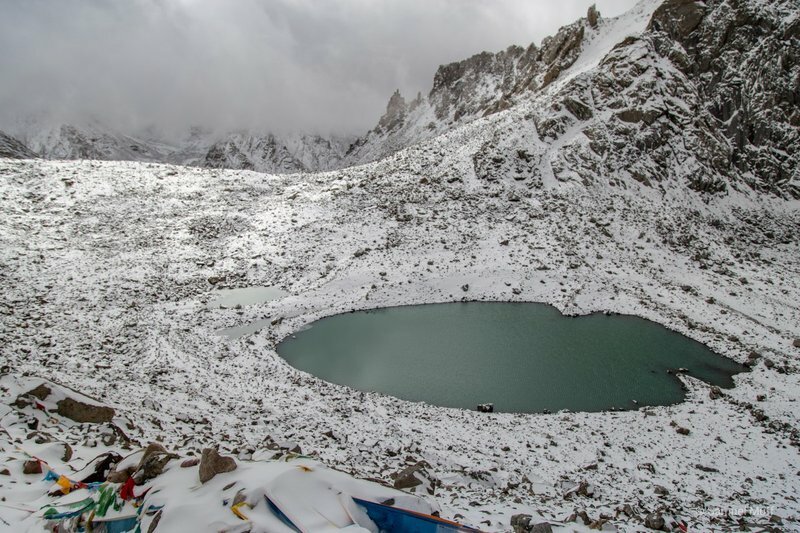 However, the weather worsened during the 4-day-trek and it got more and more cloudy. 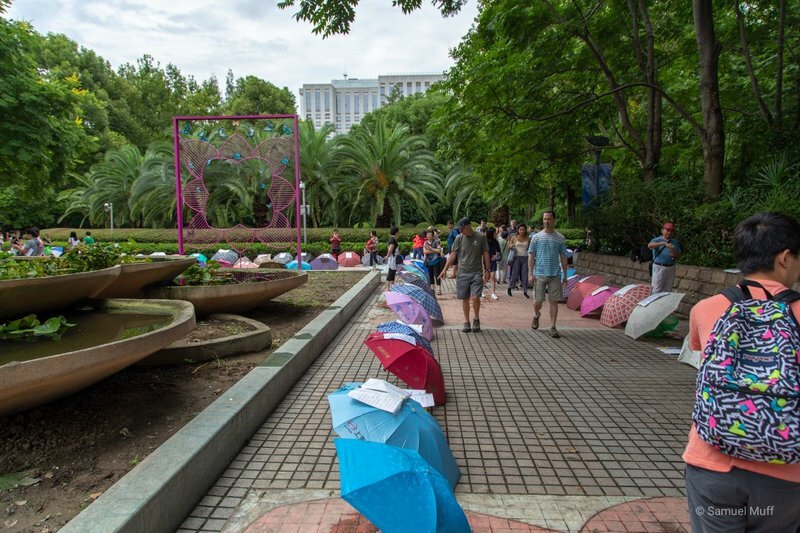 On the last day there was even a little bit of rain. Overall, we were not so happy with this trek. It might have a lot to offer for those who do it for religious reasons, but for people interested in nice hikes and good views, there is little to enjoy. 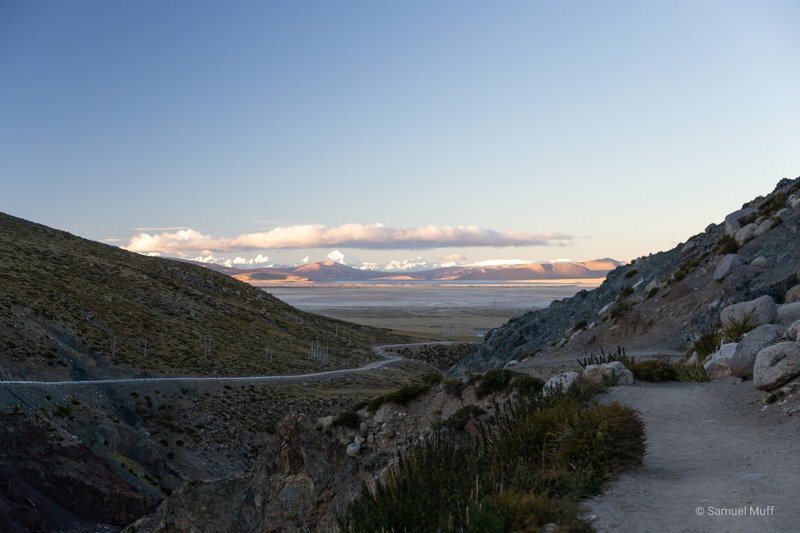 The trek is naturally very flat and follows dirt roads for most of the way, we were passed by cars 4 to 5 times an hour. The views are interesting for a day, but you see the same lake and the same 2 mountains for the entire 4 days. 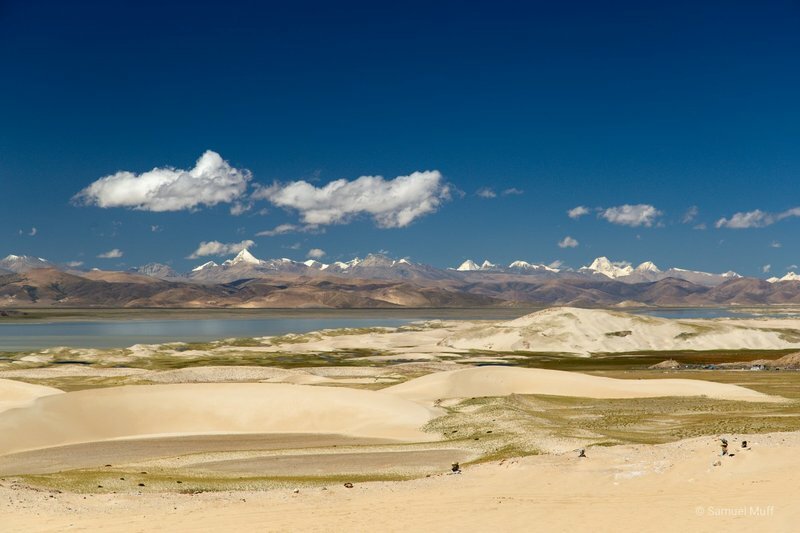 Also, due to the high altitude and Tibet’s location in the rain shadow of the Himalayas, the landscape is dry and devoid of any vegetation. The one good thing about the 4 days was the valuable high altitude preparation we received. 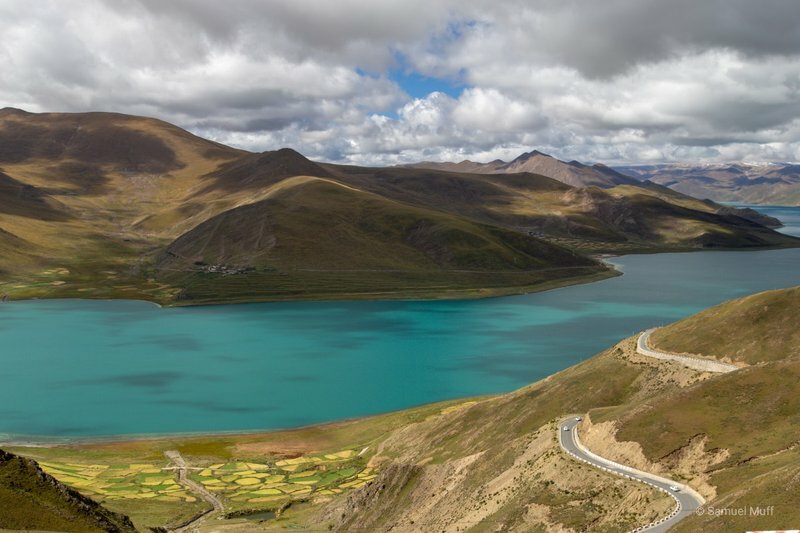 Unfortunately, it is not possible to travel freely in the Tibet Autonomous Region, so we had to join an organized tour for this part of our journey. 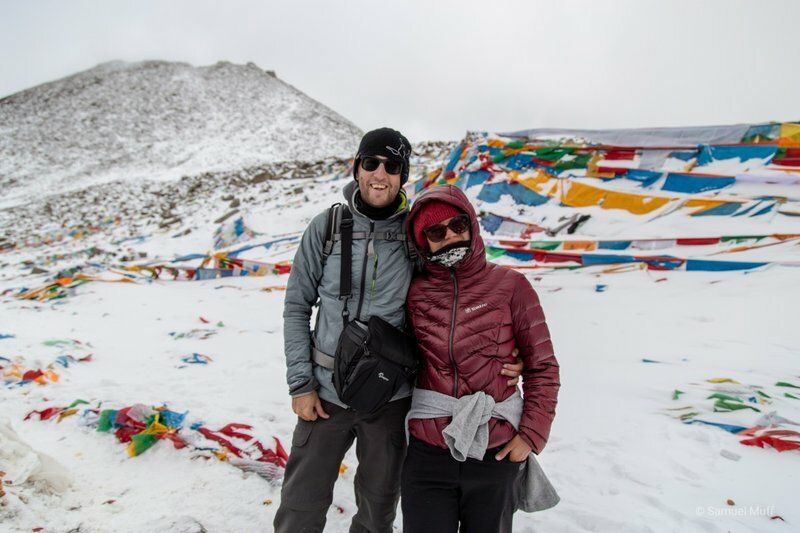 After arriving in Lhasa, we were welcomed by our tour guide Dundup at the train station and brought to our hotel. Our tour group consisted of 2 Italians, 2 Canadians, 2 Israeli, 7 Russians and us. 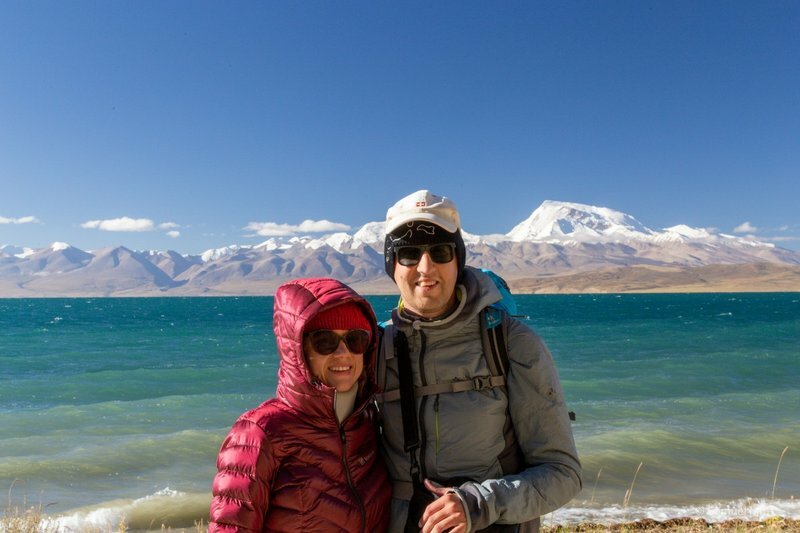 Together, we were going to travel to the far west of Tibet to do 2 koras (Buddhist pilgrimages), one around Lake Manasarovar and one around Mount Kailash. 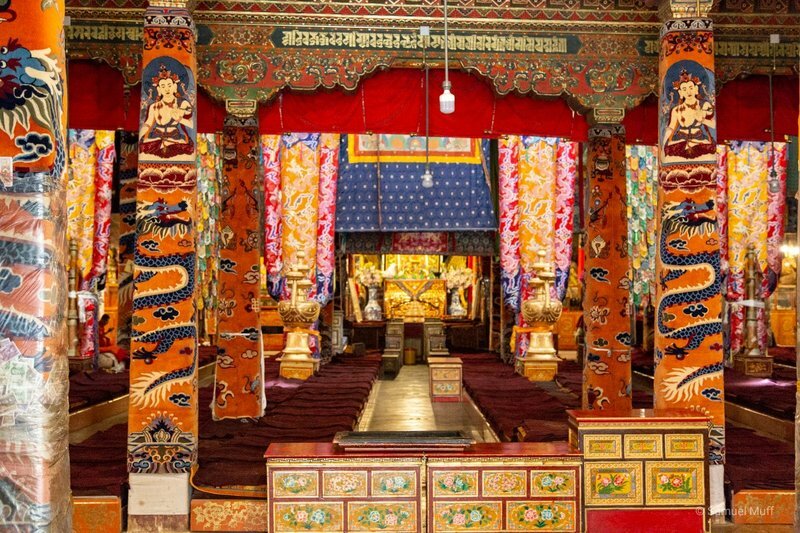 But first, we spent two days in Lhasa to see the most important temples of the Tibetan capital. 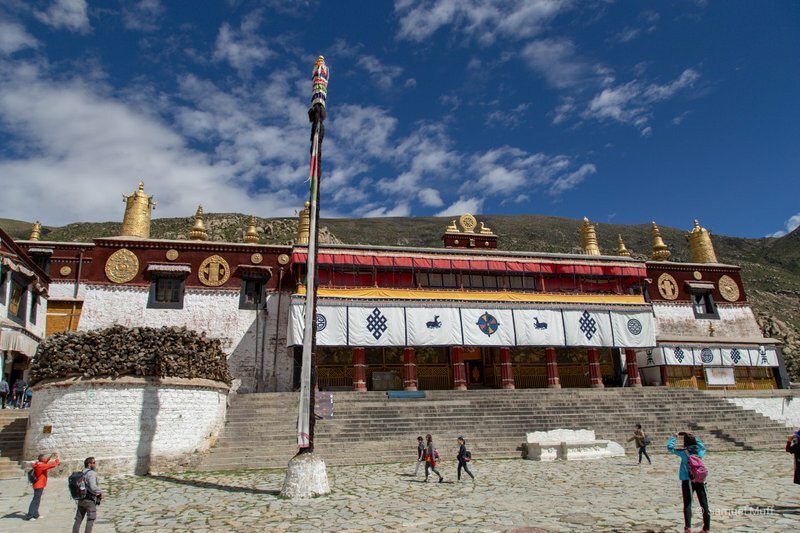 On the first day we visited the Drepung and the Sera monastery, two of the most active monasteries in Lhasa. 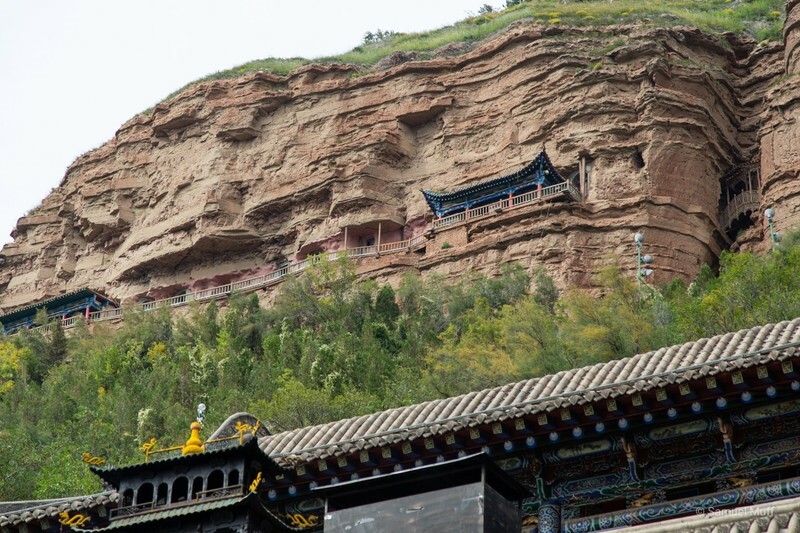 The most interesting sight for us was the debating monks at the Sera monastery. 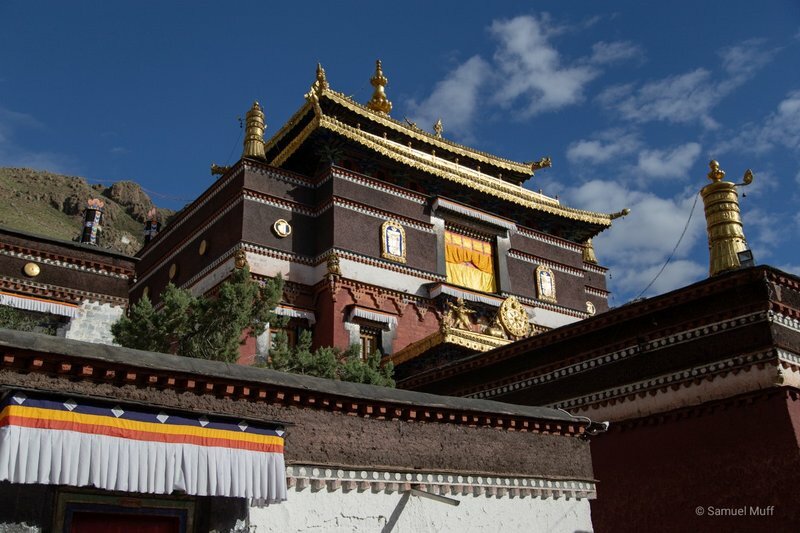 Every day from 3 to 4pm, the monks meet in a courtyard of the monastery to practice their knowledge of Buddhist philosophy and other topics. They build pairs and one monk sits down while the other stands and fires question after question on the sitting monk who has to answer as quickly as possible. The whole scene is very entertaining, loud and lively. Another interesting sight in the monasteries are the yak butter lamps. 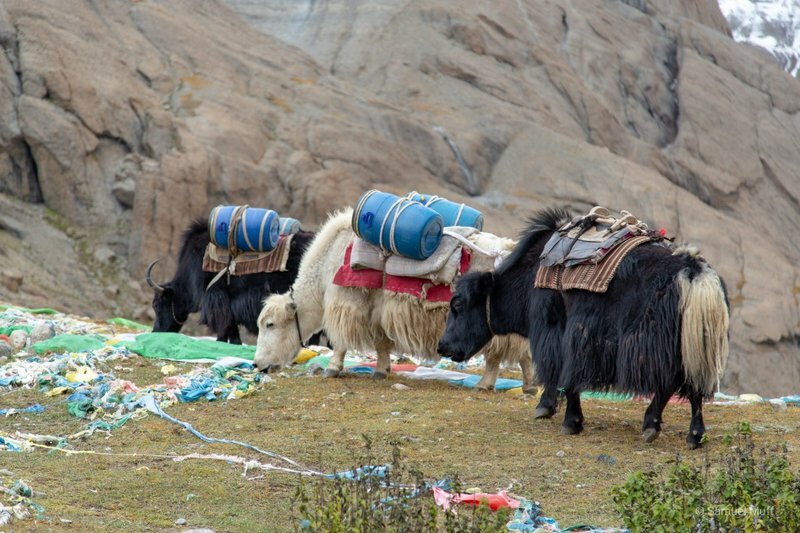 Apparently, it is common for believers to bring yak butter as a donation to the monastery and they use it to burn candles. 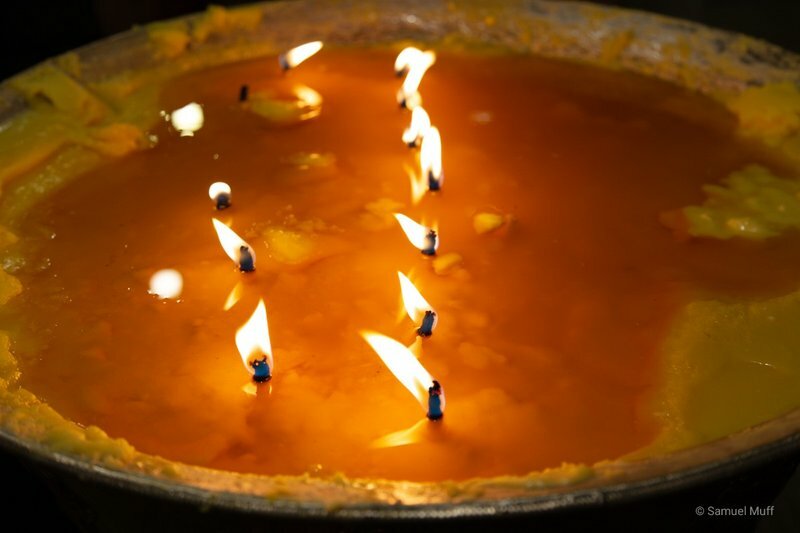 This fills the monasteries with the unique scent of melted butter. 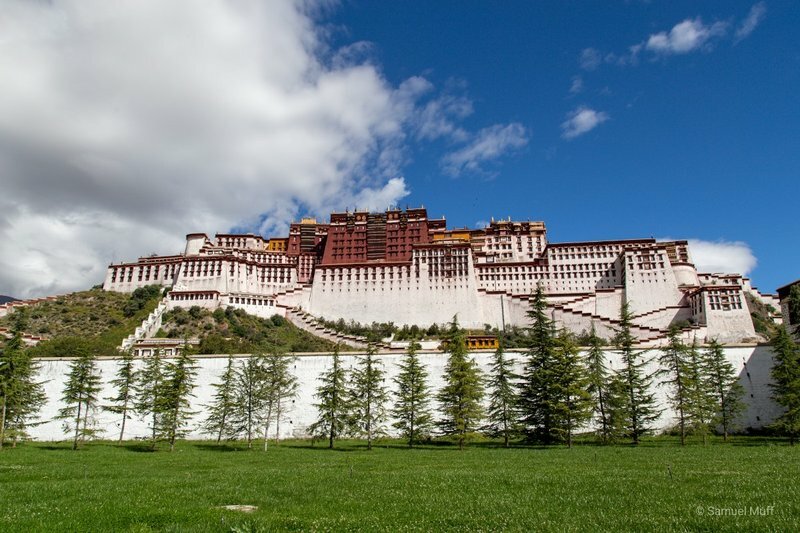 On the second day we went to visit the Potala Palace, the official seat of the Dalai Lama and thereby the former independent Tibetan government. The visit to this palace is very strictly regulated by the Chinese government and there is a lot of police and military around. While the palace is very impressive and beautiful, there is also an air of sadness around it, like looking at a nicely decorated gravestone. 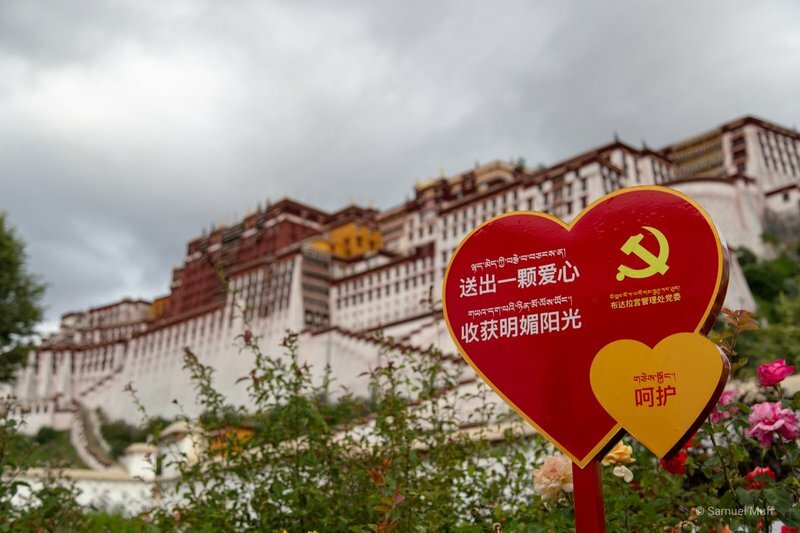 Around the palace there is a lot of Chinese propaganda, while inside you cannot find any pictures of the current Dalai Lama, since his image is banned in China. 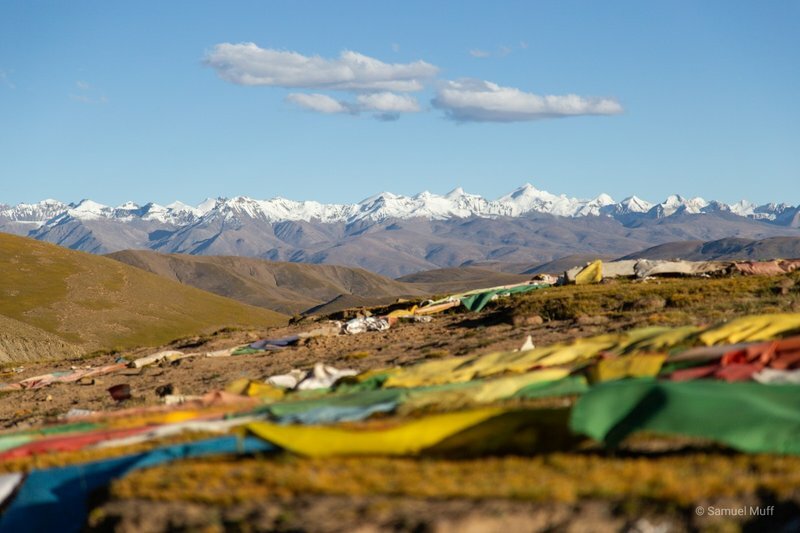 We also learned from our guide, that while China considers Tibet to be a part of China, Tibetans cannot get a Chinese passport and are therefore prohibited from travelling abroad. 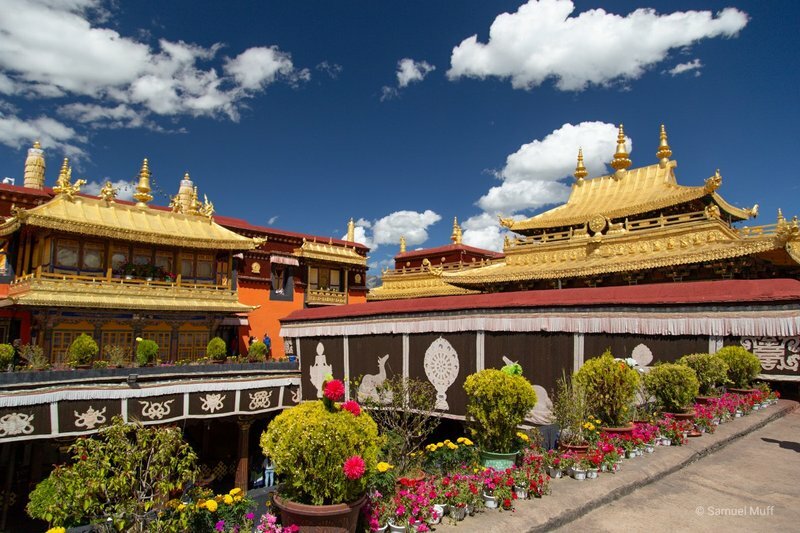 Later that day, we also visited the Jokhang temple in the middle of the city, which was built in the 7th century and is thereby the oldest temple in Lhasa. 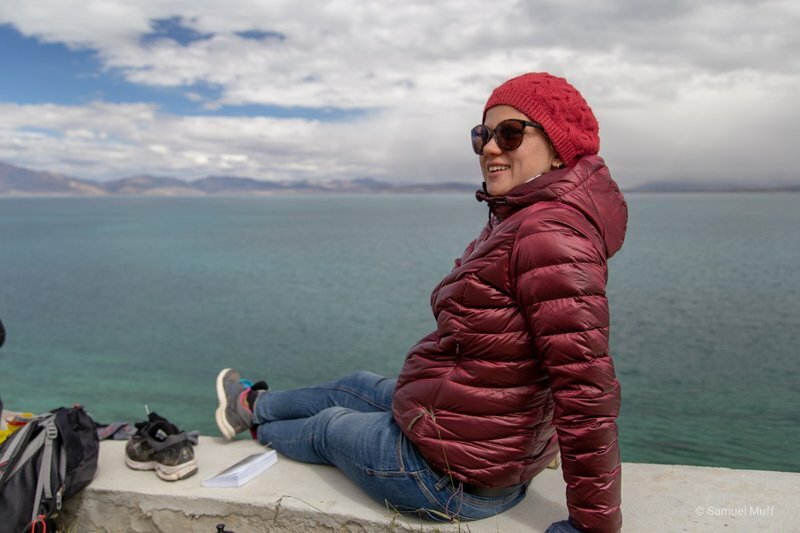 After the two days of sightseeing in Lhasa, we embarked on our journey to the west of Tibet, which consisted of 3 days mostly spent inside the car. Along the way, we drove over several passes higher than 5000 meters above the sea, visited some more temples (of which we got a bit tired at that point), saw many interesting landscapes and got our first views of the Himalayas in the distance. Since Marta was getting tired of sleeping on trains, we decided to take the first flight on our trip to go from Shanghai to Xining. 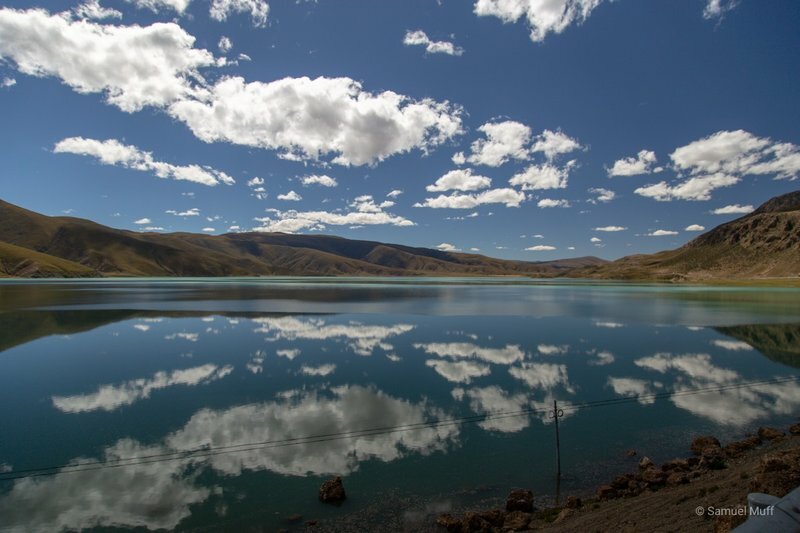 The reason we decided to stay 2 nights in Xining is that it is considered a great place to acclimatize to the altitude before taking the train to Lhasa. 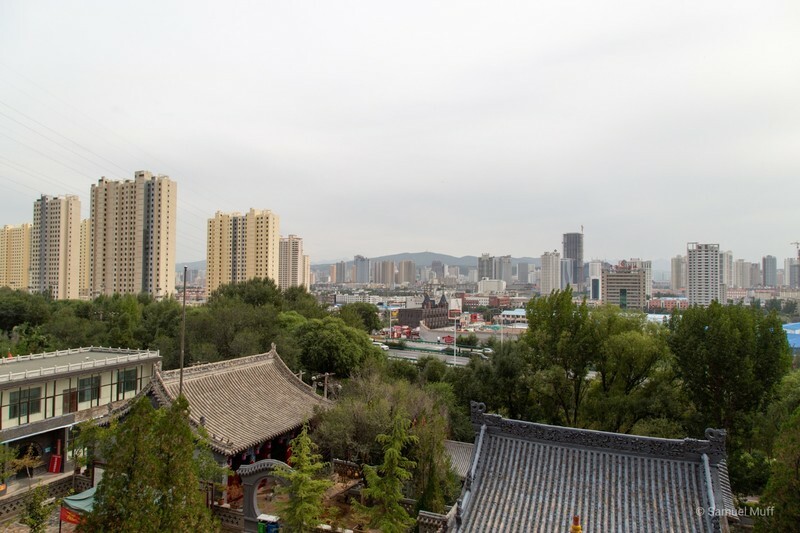 Xining is not a typical tourists destination but we found our stay there to be extremely enjoyable. The people in Xining were the friendliest that we came across in China. English is only very rarely spoken in this city, but everywhere people tried their best to help us. Sometimes by walking with us to show us the way or by sitting down with us and figuring out what to order from the Chinese menu. The hotel we stayed in was also the place that did the most to honor our honeymoon. 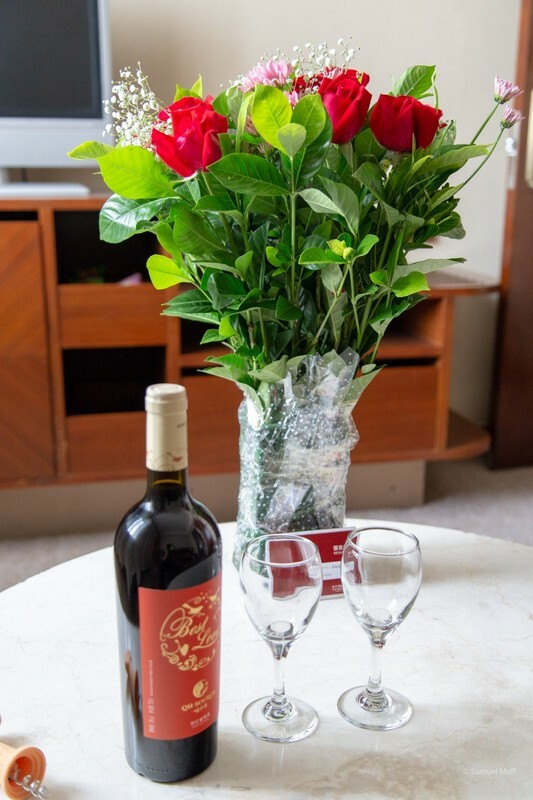 When we came back from a city walk, we found that they had changed our bed sheets and covers from white to red and left a bottle of wine, a bouquet of flowers and a handwritten card from the hotel manager for us. 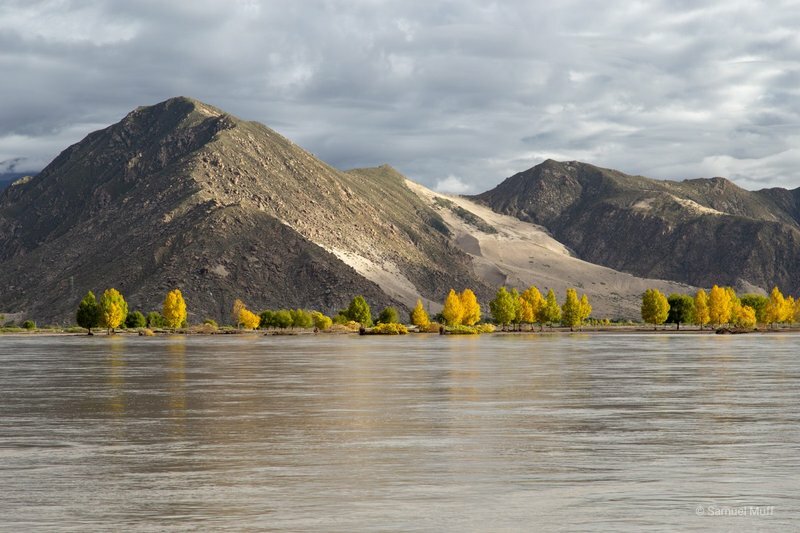 As far as sightseeing is concerned, Xining can naturally not compete with Beijing and Shanghai, but our focus was more on relaxing before the tight schedule we will have in Tibet. We went to see a temple in the north of the city though, which is built into a cliff and from where we had a great view of the city. 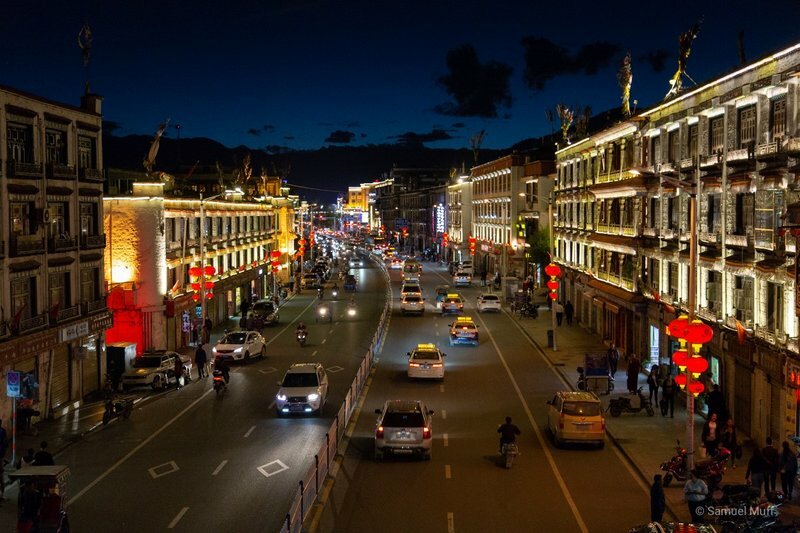 On an evening stroll, we came through the central square of Xining which was very lively. Different groups have set up speakers and were dancing together to different types of music, while many spectators where standing around. It was great to see that young and old people, men and women, where coming together to dance. The dances where all solo-dances though with very unusual choreographies for us. 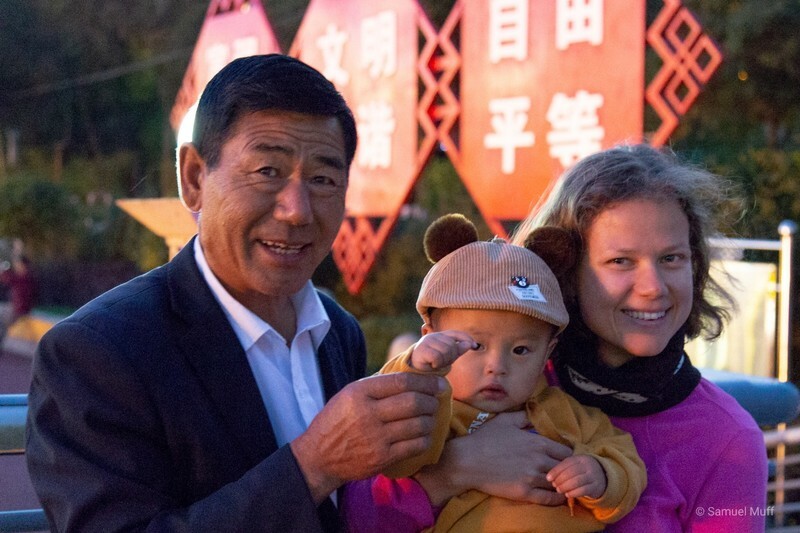 As Xining does not get many foreign tourists, we were also an attraction on the square and one family even asked Marta if she could hold their baby for a photo. 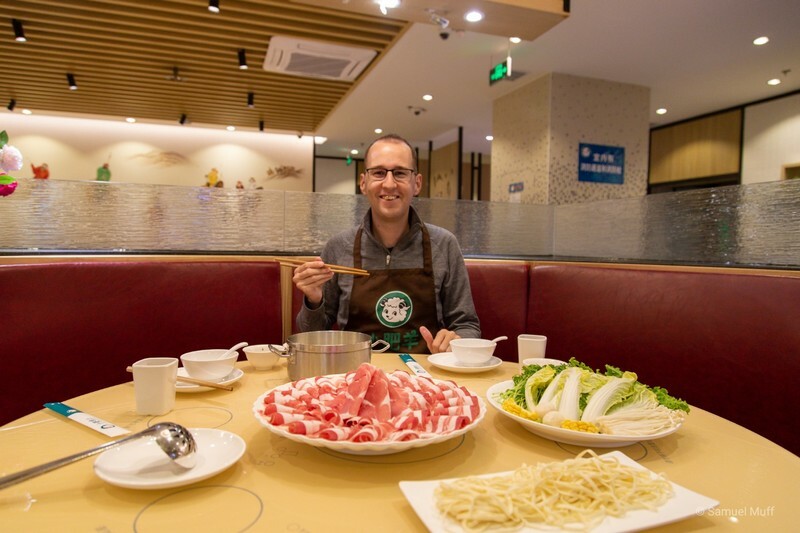 We also discovered our new favorite Chinese food chain in Xining, called Little Sheep Hot Pot. This chain specializes in hot pot with very good quality lamb as the main ingredient and it was so good that we ate there twice. The staff was so delighted to see us for a second time that they brought us lots of free food to add to our hot pot and oolong ice tea. 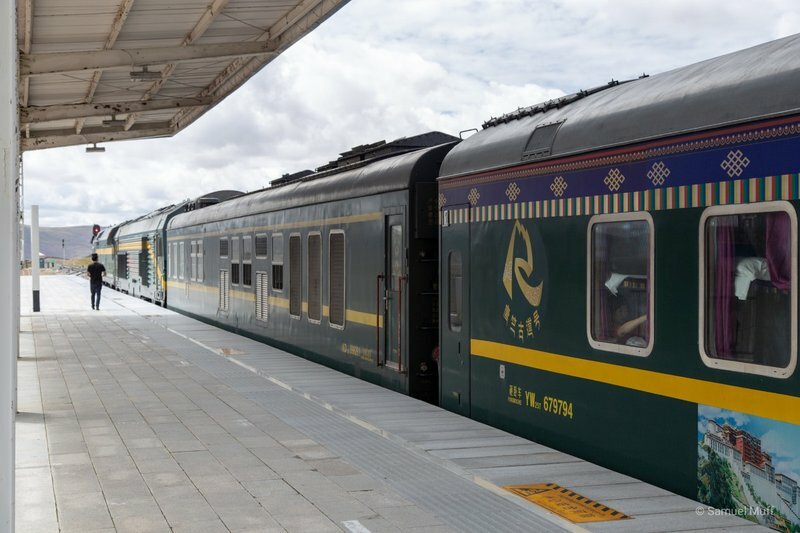 We boarded the train to Lhasa in the evening of our third day in Xining. 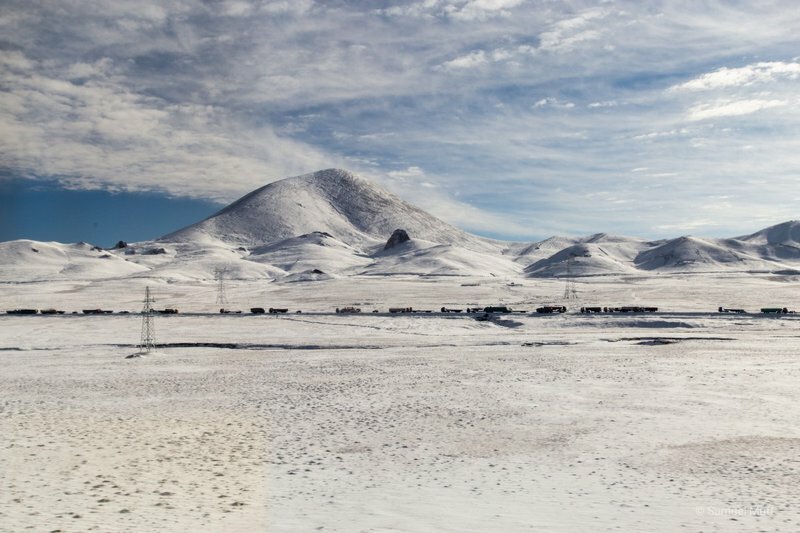 This train is famous for being the highest railway line in the world, climbing as high as 5072 meters above the sea. 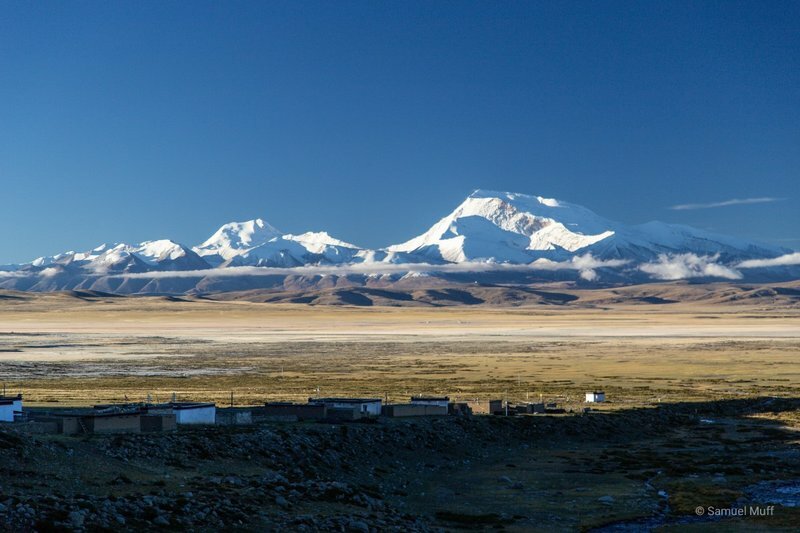 We took the train in the evening so that we would spend the lowest part of the 20-hour-journey sleeping and would be awake to see the high-altitude-landscape. Since this train is extremely popular, we could only get beds in a 6-bed-compartment but we nevertheless slept quite well. 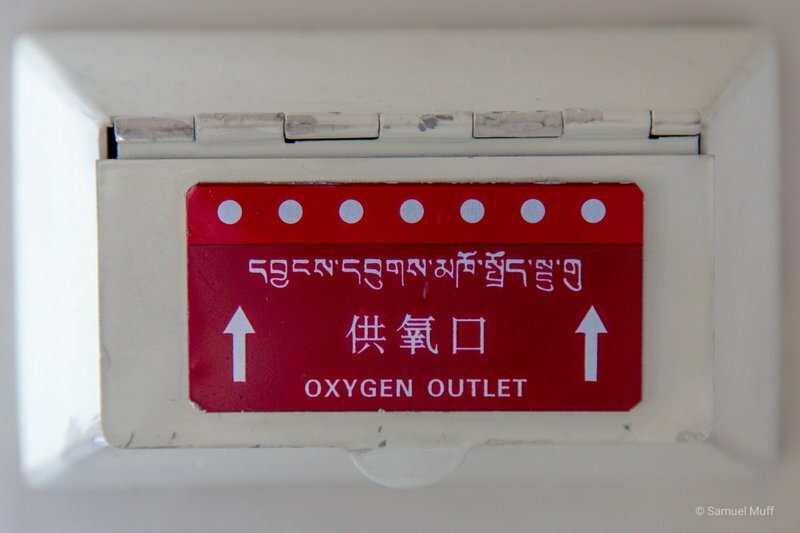 Because of the extreme altitude, only special trains run on this line that have an oxygen outlet for each passenger and a doctor on duty. 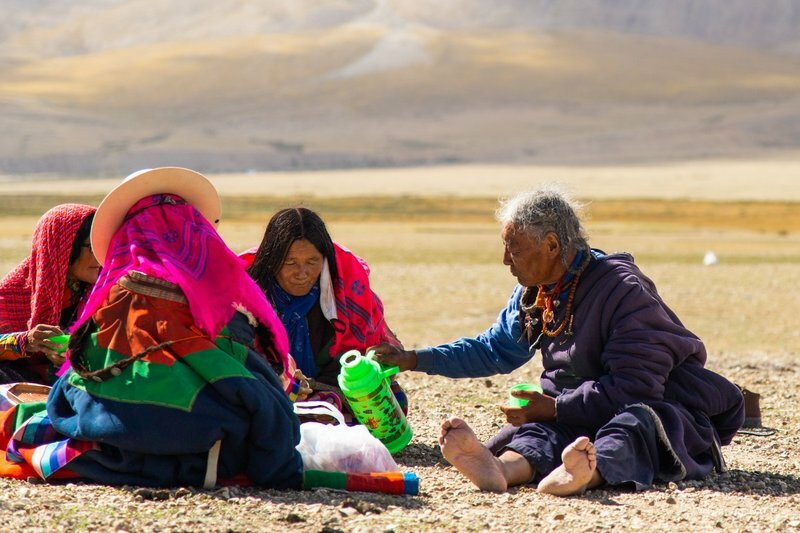 Moreover, the oxygen content in the air is raised from 21% to 25% to prevent altitude sickness. Despite a minor headache we luckily did not have any problems. 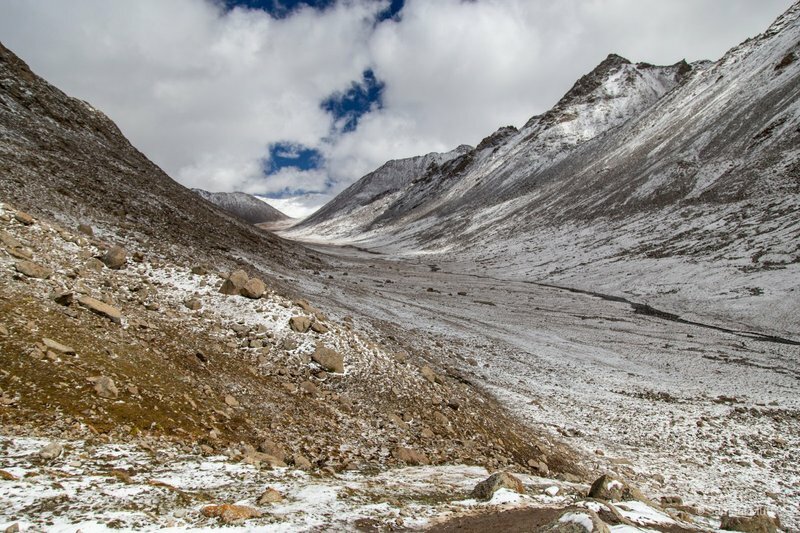 Most of the journey was spent over 4000 meters and a lot of the landscape was covered in snow. 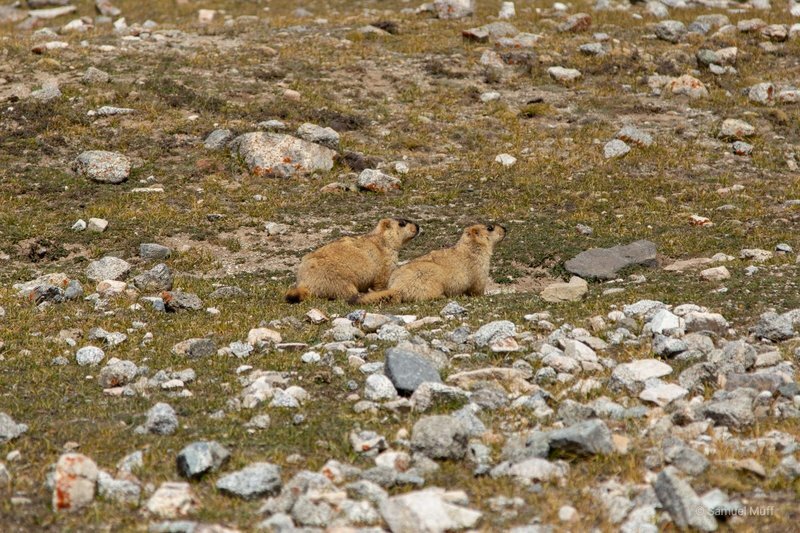 We also saw many yaks along the way and even some Tibetan antelopes. 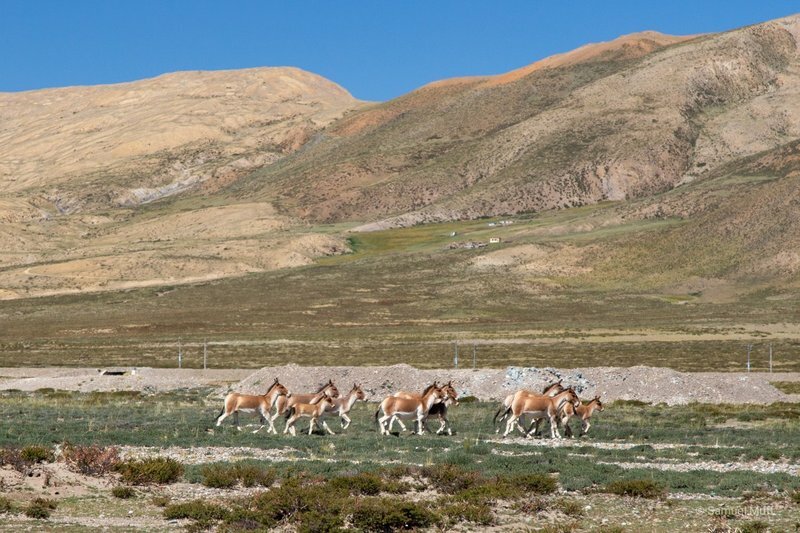 Shortly before 6pm, we arrived in Lhasa, the capital of the Tibetan Autonomous Region, at an altitude of 3650 meters. 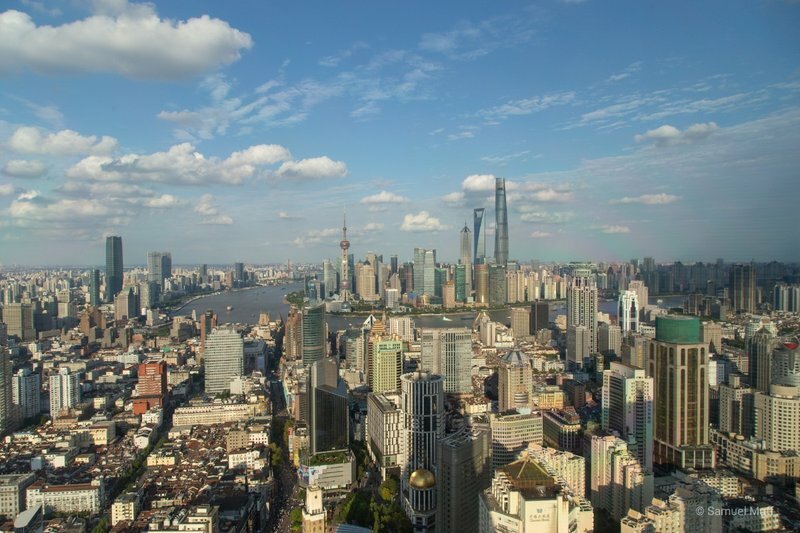 The first two things we noticed when getting off the train in Shanghai, was that it was already totally dark at 6:30pm and that it was very humid, compared to the dry weather we had in Beijing. 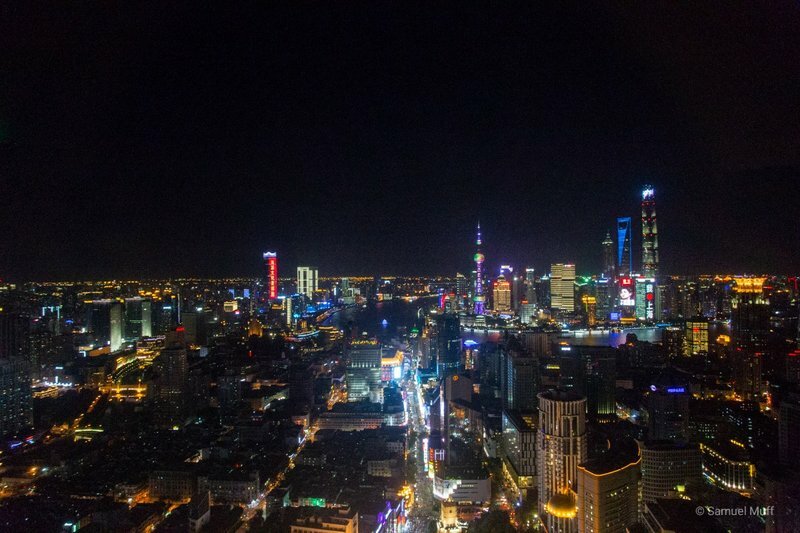 Our hotel was perfectly located right next to the People’s Square and we were upgraded to a room on the 58th floor, overlooking the city. 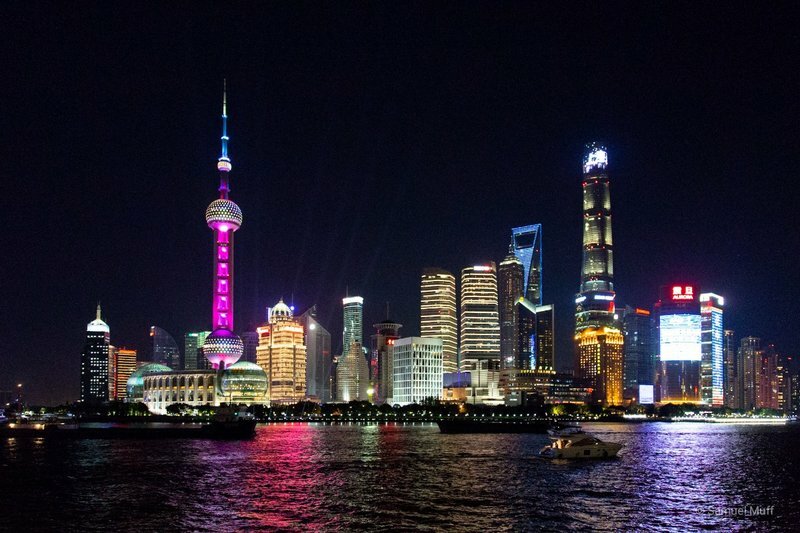 Whereas in Beijing the biggest attractions are the historical and cultural sights, Shanghai is all about skyscrapers and the skyline. 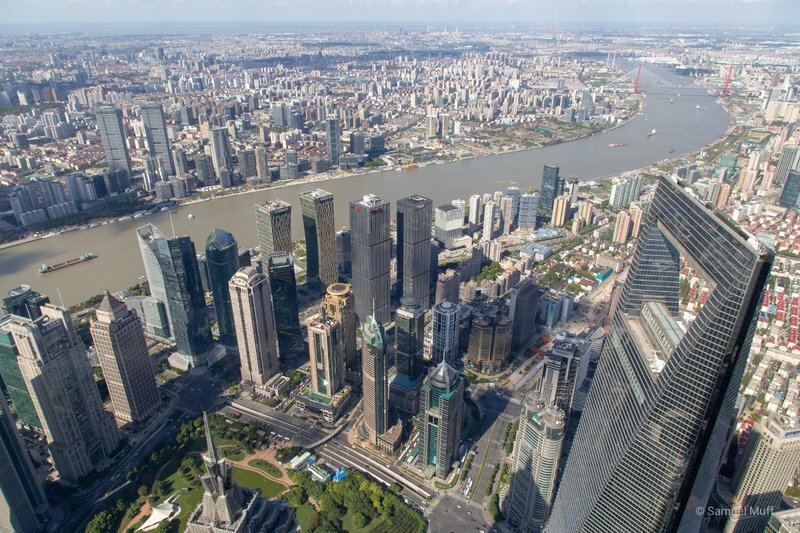 It is the largest city in China and its financial center, despite its relatively young age of only 180 years. In fact, where today the most famous skyline of the city is located, 20 years ago there was absolutely nothing. 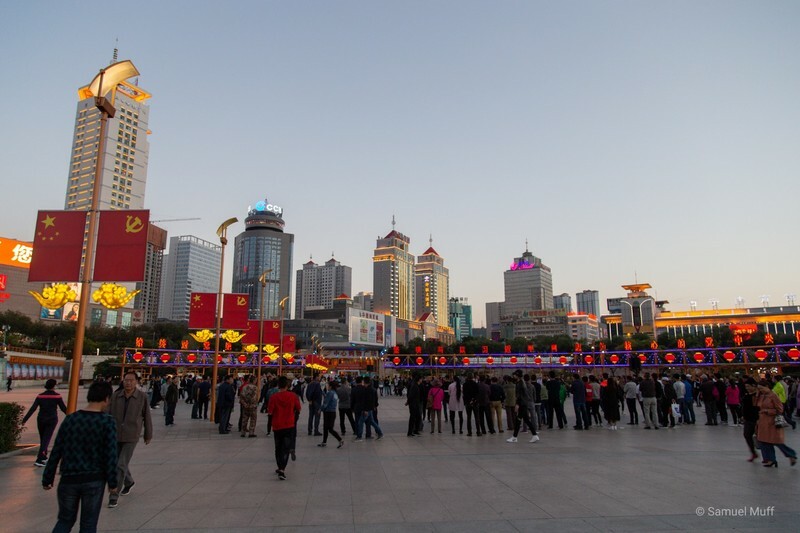 Probably nowhere else you can feel the economic growth and prosperity in China more than here. 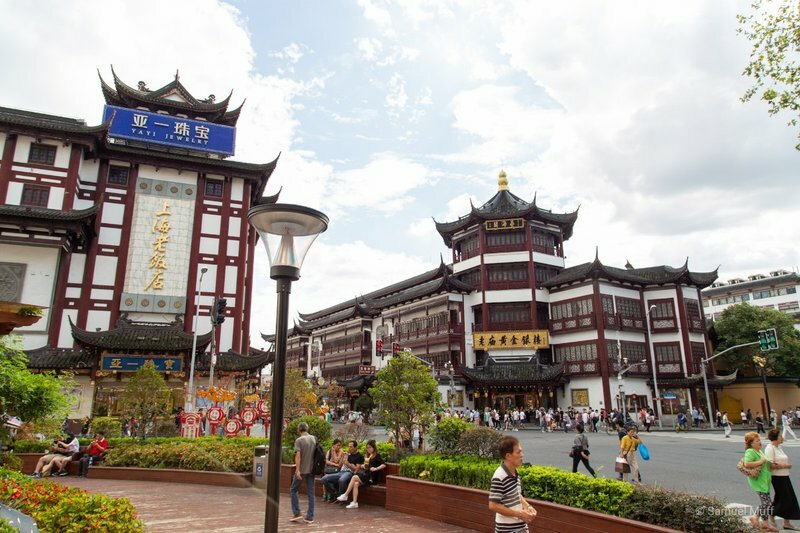 One might expect to see a lot of Western faces in this city and while there might really be a lot of them in absolute numbers, they are so massively outnumbered by the Chinese locals and the Chinese tourists, that one might easily believe to be the only non-Chinese around. On the morning after our arrival to Shanghai, we joined a walking tour around the center of the city. Our host explained to our group of 30 Westerners that we shall not be offended if we spark curiosity among the Chinese. 90% of Chinese never left their country, therefore seeing a Westerner is a major attraction for them. So it happened that many Chinese took photos of our group or made selfies with us in the background. The most interesting part of our walking tour was the marriage market, where local parents try to find a partner for their son or daughter. They post the most important information, like height, age or how much they want their partner to earn on a piece of paper that they put on top of an umbrella. As our host explained, there is an immense pressure on young Chinese to marry, as it is considered an integral part of being successful in life. 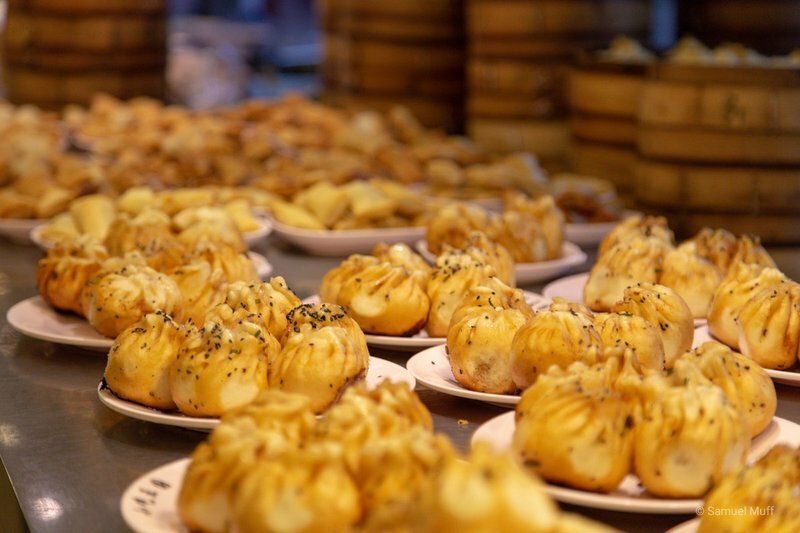 There is apparently a Chinese word for unmarried people of 30 years or older, that roughly translates to “left-over”. 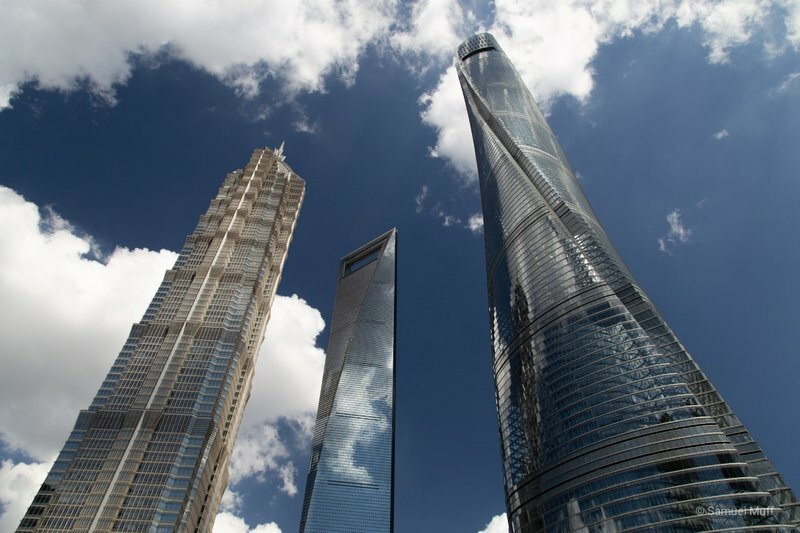 On our second day in Shanghai we went to visit the Shanghai tower, at 632 meters the second-highest building in the world. In the tower we went to the world’s highest observation deck, brought by the world’s fastest elevator, travelling up to 18 meters per second. The scale of this city is impressive and it is fascinating to look at it both by day and by night.